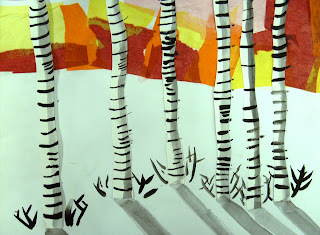 Painting birch trees is a perennial favorite in art rooms. And for good reason. They're easy, accessible and impressive. 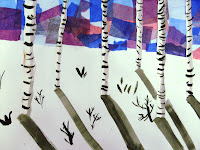 I thought this take on the standard birch trees was equally as pretty. 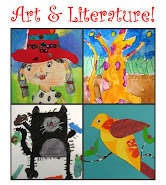 I believe I found the idea on Artsonia, but shame on me, I forgot to note the art teacher. After a discussion on warm and cool colors, the children chose which temperature they preferred. Choosing only those colors, the children tore the tissue paper into small scraps and adhered them to the top of the paper using Mod Podge. 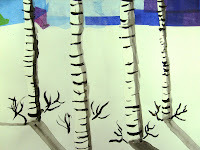 Tip: brush both the paper and then again on top of the tissue to make sure it sticks well. I encourage the kids to brush the tissue paper flat; no bunching. 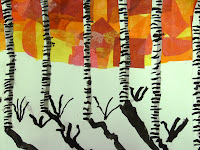 Most important part of this step is to create a smooth line of tissue paper across the page. If the tissue paper has dents and cuts, it won't look like a horizon line. 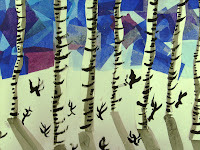 Using scissors and scraps of white sulphite paper, cut long strips of curvy--not straight--trees. Vary the dimensions. Make sure no straight edges remain. Using black watercolor cakes, demonstrate how to vary the intensity of the black paint using water. 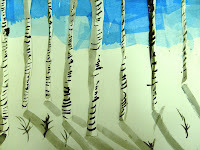 With a watery "gray", run a strip of paint along one side of the trees, going from top to bottom. Glue the trees to the paper, varying the distance form the bottom that the tress are placed (closer to the bottom, the closer the tree). Make sure the kids extend the trees right off the top of the paper. Tip: The shadow side of the tree needs to be consistent. 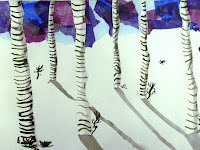 Using a medium intensity black paint, brush "shadows" from the base of the trees to the bottom of the page. Step 5: Step back and admire! What grade did you try this with? Love it! Thank you so very much for posting your lessons! I absolutely love them and they are successful in the classroom! I always seem to find something new that excites me on your site! 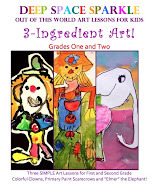 Thank you for sharing with other art educators!!! !